The following strategic steps are designed to be practical – from idea to the implementation of a project. In hindsight, this was our process. At the time, we didn’t know we were doing this but the formation of the FRC followed this guide. This is what worked for us but there is no “one size fits all” or correct method. In thinking about how to replicate a version of our model that works for your campus, there are many ways to approach it. With that said, start small with one or two activities and go from there. It’s often difficult to know the difference between a perceived need and a real one. A campus-wide survey can be very helpful to understand more about the specific challenges for student-parents. We finally did one after ten years of programming and learned a great deal. Typically, it’s better to be armed with data to make a case for implementing a program. In the beginning of our FRC journey, student-parents expressed family challenges. As similar stories emerged from multiple parents, it was easy to identify a pattern and a clear unmet need. The common thread among the students we talked with was the difficulty of simultaneously pursuing an academic career while taking care of their family. Our first activity was a discussion group for student-parents. 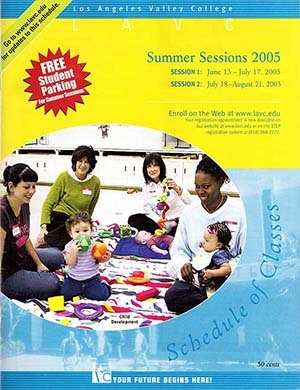 They expressed interest in bringing their young children to campus and creating a playgroup. We found a space on campus, purchased toys from yard sales, invited child-development students to intern, and a weekly playgroup was born! After you know there’s a need – even if you don’t know exactly how you want to proceed – take some time familiarizing yourself with existing services on the campus. Likely, there are many student programs that serve student-parents without realizing it or without calling it out. Survey all the programs that support student-parents in any form and talk to people who are involved in implementation. Find out where possible gaps might exist. For example, you probably have a math lab but it might not be open during a convenient time for student parents. It’s likely that the math lab is unaware of this particular issue and could possibly adjust their open hours. By discussing the problem with them, you can address the issue so that student parents can take advantage of their services. Building upon and communicating with existing resources is the easiest and most cost-effective way to get started. It allows you to start slowly and build upon your successes. Collaboration is a two-way street; your partner will also benefit from the information and resources that you bring to them. They may be thinking about the same issue but not had the impetus to address the problem; you can do it together. Campus collaboration can put existing resources to better use and build strength within the campus community. We partnered with our Child Development Department and used students as interns to work with families in playgroups. This addressed two important needs – playgroups became a “lab” for child development students to have practical experiences, and at the same time, was a no-cost solution for staffing playgroups! It is crucial to find an administrator who supports your vision. That person will be integral to this process. She or he understands the complexities of your college system and how to proceed. Including that person in conversations or at events on this topic will help them to see your individual student-parent situation as a piece of a bigger policy issue. That person will also become your advocate with other high-level administrators, as well as continuously help you to make campus and community connections you may have overlooked. One of our deans became very interested in, and subsequently supportive, of the FRC when she learned about the academic theory behind our approach and philosophy. She was able to see the “big picture” and advocate for the FRC. What departments on campus and community agencies off campus are related to supporting student parents? As opposed to piggybacking on existing campus programs, this step is about partnering: learning what’s on your campus and who you could work with to develop unique services. We didn’t even know that we had homeless students attending classes on our campus, until the CalWorks program brought us students with children who had no where to live. Between the FRC and CalWorks, we were able to find the families temporary housing and help them with their children’s needs. Community support is also helpful; don’t underestimate the power of word-of-mouth. There are multiple organizations that can help with spreading the word or getting programs started. For example, our local regional center, which evaluates infants and toddlers with special needs, referred families for playgroups very early on. This immediately upped our presence and our reputation in the community. These groups will become your “community champions” and can help to build a potential advisory board. Our local regional center, which identifies children birth through age three with special needs, no longer has funds for “socialization groups”. They refer families to the FRC, and we benefit from a richer and more diverse group of playgroup families. It’s beneficial for the families who attend, as well as the child-development students, who learn from the opportunity to work with children who have special needs. After looking at options for partnering, leveraging and building with existing funding, it might be time to look for new funding. Any data you can keep about student-parents on your campus will help you make your case. It's important to know what's going on nationally with student-parents and college success. There is research and data available about the challenges of community college student parents on the Institute for Women’s Policy Research website. There you will find research and data, as well as models of successful national programs. With this information as a complement to any data you’ve been able to garner, you will be able to make a stronger case to funders. An additional consideration that may or may not be tied to funding, is where to house your efforts on campus. Taking into account that at any given time, nearly one third of all students have a child in the home, student parents exist in every single department and discipline. This population tends to come-and-go from campus when classes are over, and not spend much extra time accessing resources. Thus, services need to be housed in visible locations that are easily accessible to students all over campus.